MCACS had a good turnout for Winter Field Day (WFD) on January 26-27. This was the first time we participated as a group. 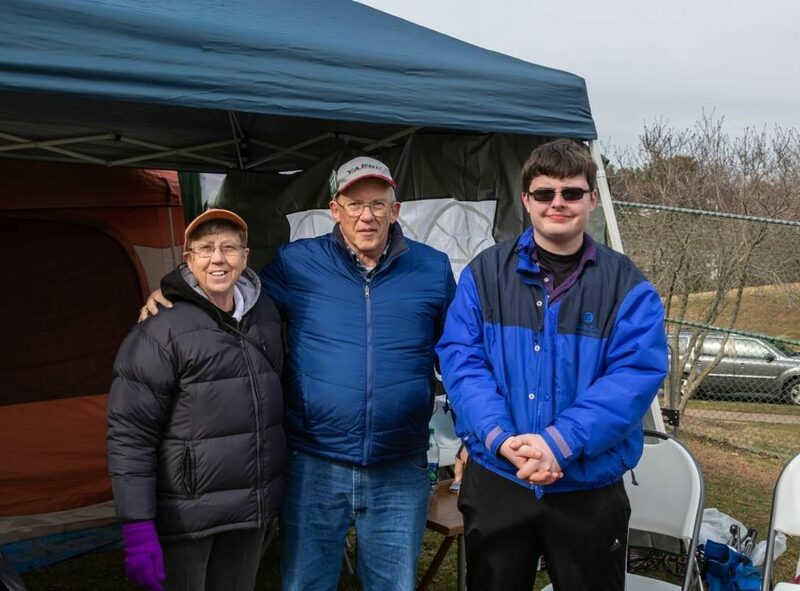 For those who are not familiar with Winter Field Day, if is very much like the ARRL Field Day event that takes place in June, but is organized by a small not-for-profit group that operates on a shoestring and exists solely to make Winter Field Day possible. The premise is that emergencies don’t always happen in the summer, and we need to practice deploying under winter conditions. It’s that simple. For general information about Winter Field Day from the sponsoring organization, please click here: https://www.winterfieldday.com/. We operated in Class 3-I (Three-India) using the MCACS call sign, WA3YOO. When the dust settled (or maybe I should say, when the mud dried), we had 234 contacts in the log. We reached 63 unique ARRL/RAC sections, 44 of the 50 states and 4 Canadian provinces. That’s pretty cool, when you think about it. We reached all four corners of the lower 48, and also Alaska and NW Territories. 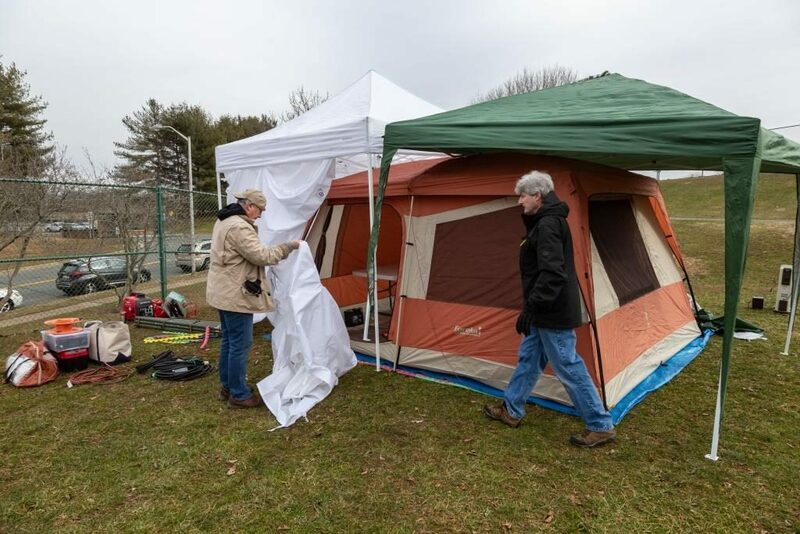 Although Saturday started out chilly at 20 degrees, we had a gratifyingly large crowd assembled at 0800 to begin setup. The first challenge was maneuvering the MAIPN van, with its 13-plus foot superstructure, under a low-hanging bough to reach the site. With that accomplished, we quickly divided into crews to set up antennas and shelters. The temperature climbed into the 40s. However, that resulted in a quick thawing of the field, and more than one of us managed to land on our backsides on the muddy hillside. By 2 PM, we had everything operational. After sunset, the temperature dropped back into the 20s, but our night crew continued to make contacts throughout the wee hours under relatively balmy conditions inside our tent and van. The tent-in-tent concept seemed to work well, as a single small ceramic heater was sufficient to keep the tent warm. RFI from at least one of the Honda inverter-generators was an issue, but a member quickly produced an in-line RFI filter that brought the noise level on 80m down to a reasonable level. We will be looking into this issue more closely. The MAIPN van has an-onboard generator and an RV-style ceiling HVAC unit. For those reasons, it was classified as an indoor station under the event rules. 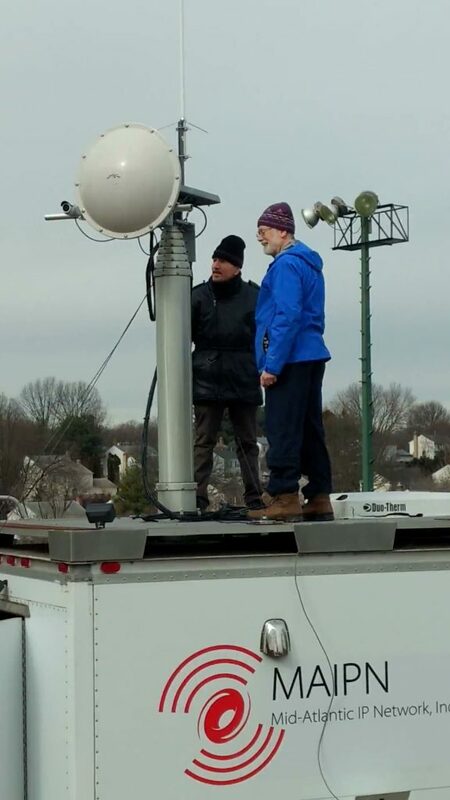 We used the van’s 48-foot pneumatic mast to support a 2m/440 base station antenna as well as an inverted-vee antenna. It’s really nice to have a station that can be ready to operate shortly after arriving on scene. 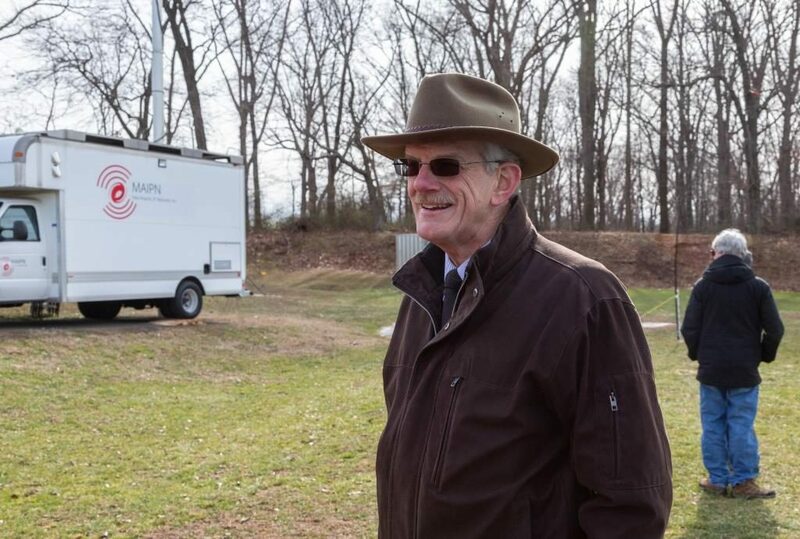 We were more interested in giving everyone who wants to a chance to operate than in making maximum QSOs. 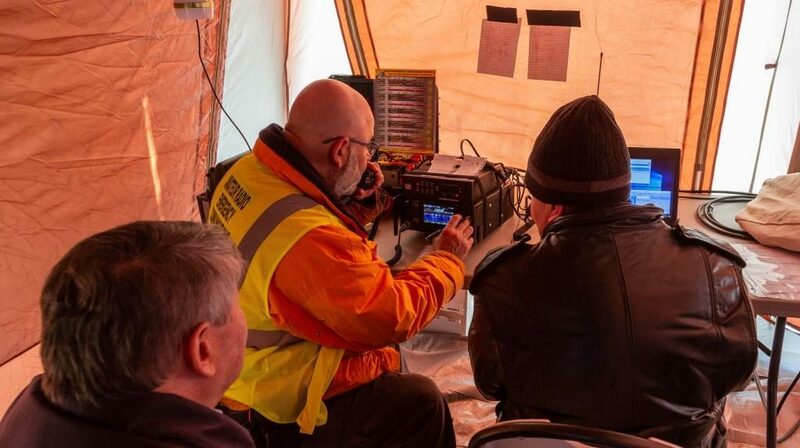 Really, the focus was on the technical and logistical aspects of setting up functional stations under winter conditions, and having our participants test their personal preparedness and clothing under those conditions. 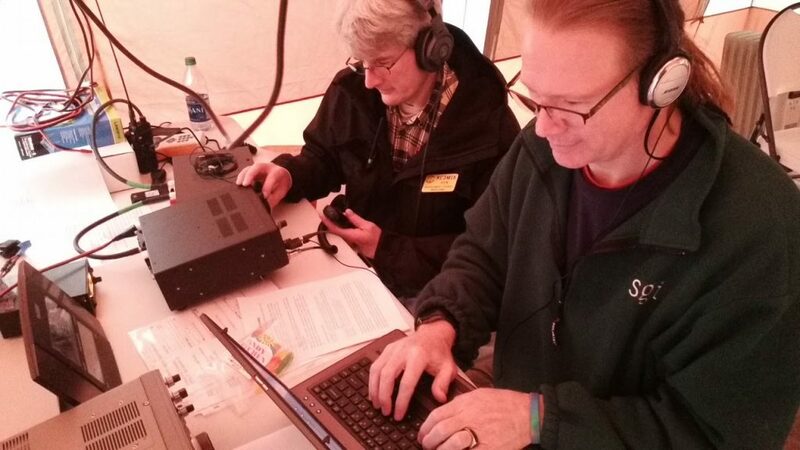 Several new hams had their first experience operating HF, and a number of hams tried out their go-kit stations over the course of the weekend. 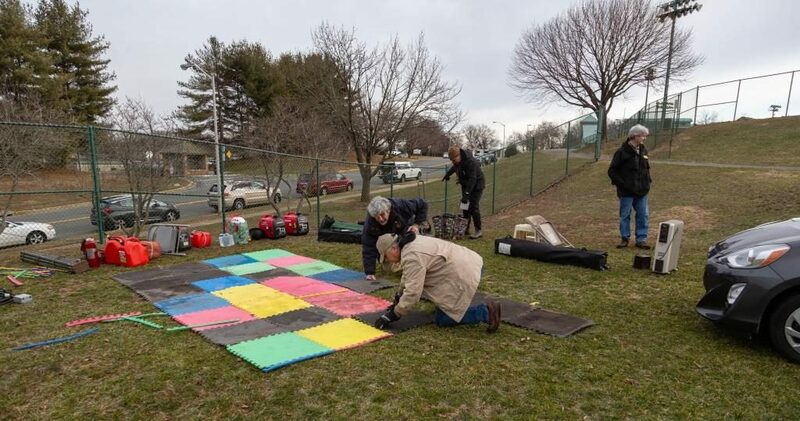 We were grateful to the Gaithersburg Department of Parks, Recreation and Culture for enabling us to use Robertson Park. We set up on the edge of a soccer field, carefully avoiding buried irrigation lines that the city staff had flagged for our benefit. Our hosts went out of their way to make it possible for us to use this site, and in return, we were careful to “leave no trace behind,” being especially careful to avoid damaging the playing field. Tent-In-Tent under construction — The 10’x13′ Eureka Copper Canyon tent was completely enclosed under two canopies, with a third canopy providing a spacious vestibule. Here, the canopy side walls are being hung. K3MRI’s elegant antenna system in mid-deployment. 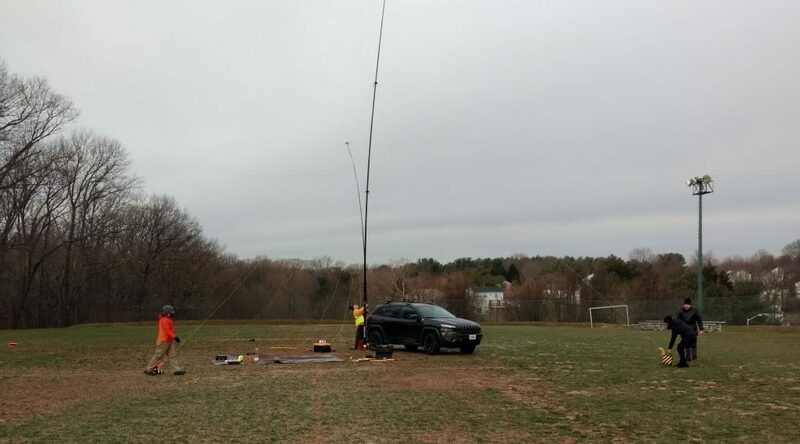 The taller mast supports a 63-foot wire vertical antenna, and the shorter mast supports a broadband dipole. Preparing to raise the pneumatic mast. 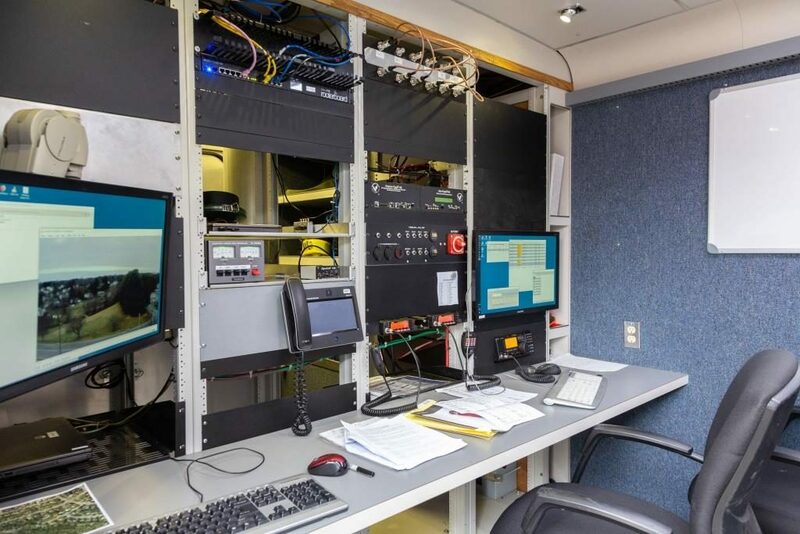 The van’s broadband microwave equipment was not used in this exercise.